Fish, shrimps, crabs, pork knuckle and poultry are important food symbols during the Spring Festival. However, we cannot omit the importance of having greens during such festive celebrations, especially in this modern society. Having too much meaty and seafood stuff, in addition to sweet beverages and alcohol, it might not be as abundant as we think we would received in the end of the day, if we do not take the right balance in our diet. :) Besides, vegetables do play an important role in symbolizing closeness (in relationship) and vitality to life. ‘Closeness’ (亲 ‘qing‘) has the similar pronunciation as ‘Green’ (青 ‘qing‘) in Mandarin. Lettuce, as 生菜 ‘sheng cai’, in Chinese，the first character, ‘生’, has often been related with the character ‘生’ in 生气, the flow of vitality to life. It also symbolizes money making, 生财 ‘sheng cai’. So, how can we omit having vegetables here? Having said so, I just hope you like my recipe. (1) Mix minced pork meat and minced prawn with the listed seasoning (B). Place the meat mixture into food processor and blend with low mode for few seconds. Transfer mixture into a bowl and season for 30 minutes, or longer. (2) Bring a pot of water to a boil. Stir in salt. Place few cabbage leaves at a time into the boiling water to blanch the leaves till soften, and then, transfer the soften leaves to iced water for few seconds and remove to drain on strainer. Then, gently pat dry each leaf with kitchen towel. (3) Place 1 large leaf of cabbage flat on a clean table top. Do cut away the thick white part of the cabbage, if you find the greener ‘leavy’ portion is large enough for the wrap. Otherwise, the roll may appear too thick. Scope a heaping spoon of meat mixture (more or less) and place it nearer to the end of the cabbage leaf. Use the spoon or your clean bear hand, to arrange the meat filling snugly before rolling up the cabbage leaf. Handle the cabbage leaf gently to avoid tearing. Repeat step until all the ingredients are used up. (4) Then, place the cabbage rolls seam side down on a large deep place, leaving small gap between the rolls. Steam the rolls for 10 minutes. When done, gently transfer the rolls to a nice deep serving plate. Please do keep the broth yielded from the steamed rolls aside, for later. (5) Heat wok with sesame oil over medium fire. Add in garlic and stir fry till fragrant. Return the liquid of the steamed rolls kept aside just now to the wok. Add in also the chicken stock, oyster sauce and Shao Hsing rice wine, and simmer till bubbling. Lastly, stir in corn starch slurry to slightly thicken the gravy. Heat off. Scope and drizzle the gravy over the cabbage rolls. Serve whole rolls or cut halves. 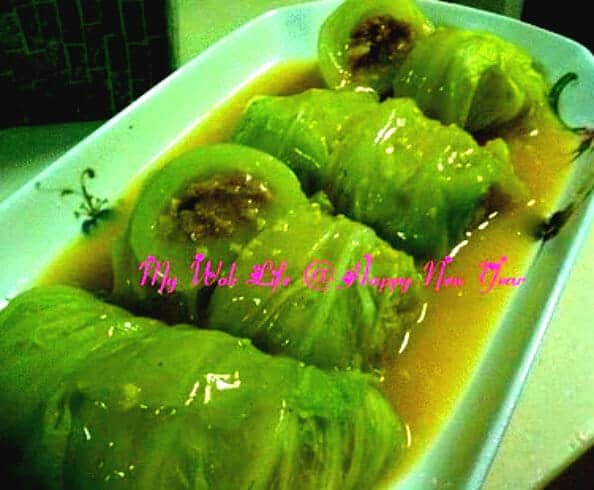 A large Chinese cabbage roll stuffed with ground pork and prawn counts about 150kcal. Tips: If the gravy appears too little for your liking, increase chicken stock to 100ml, and/ or add less corn starch slurry. * Instead of adding oyster sauce, try the dried scallop sauce (or oyster sauce with dried scallop shreds). It enhances the presentation of the dish by the appearance of its shredded scallop over the cabbage rolls, making the dish look more elegant and abundant, especially for the festive. * The whole leaf of Napa cabbage could be used for the wrap (I used whole leaf and found that the roll appeared too thick), or use only the leavy portion if it is large enough for just one round of wrapping which will be good enough. Prepare more Napa cabbage leaves to make more rolls, in this case. * Adjust the amount of meat filling to the capacity of the cabage roll. Looks yummy! Come and join in the fun… you may consider submitting this post to Aspiring Bakers #15: Auspicious Dishes for CNY (Jan 2012) hosted by me.